"Every building had ways in and out that a thief could exploit. Nothing was impenetrable or invincible." You see her running through the neighborhood, hair tied back, adorned in a form-fitting athletic tank and leggings. She has the pace of an expert athlete and the appearance of any other young 20 something-year-old whose parents probably pay for her to enjoy the privilege of living in the neighborhood. She fits in with the affluent surroundings with ease. Before you think to looks again, she's out of your sight and out of your mind. You couldn't conjure up an image of her if you tried. All of this, of course, is intentional. Elle veers off of the sidewalk to the edge of the house. Although she doesn't live in the area, she's observed the people here enough to blend in. She's been burglarizing homes since her youth, so entering this one poses no real challenge. She slips into the building undetected and begins taking stock of her potential score. The walls are aligned with artwork that only someone with money could own. Elle quietly makes her way into the master bedroom. Before she can locate the safe, she spots the recently dead bodies of two women and one man. When she looks at the opposite wall and sees the red light on the video camera, Elle knows she is in trouble. Thomas Perry's latest release The Burglar sees him tackle a unique mystery with an alluring main character. Elle's approach to theft is almost surgical in its precision. Perry mirrors this scientific like approach with bare prose that focuses more on descriptive action than exposition. While this writing style works well for this particular narrative, it does create a bit of detachment to the story. We don't get much backstory or character development outside of Elle's point of view. Fortunately, Elle is a fascinating character who precariously balances the line between right and wrong. I took more joy in discovering more about her as a character than I did in solving the actual mystery. She is the kind of person who purposefully creates distance between herself and others, even leaving her group of friends in the dark about some of the trouble she is in. I found the end of the novel to be a bit rushed, leaving some plot points unfulfilled. Still, there's no denying the skill and restraint that Thomas Perry's latest novel displays. The Burglar may not be a nail-biter, but it is still a solid read. For more information, visit the author's website, Amazon, and Goodreads. 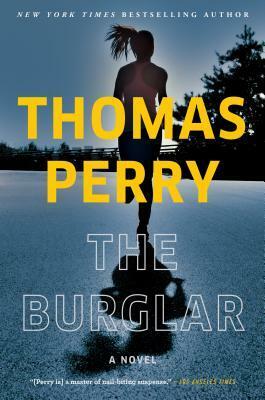 This entry was posted on Monday, February 11, 2019 and is filed under Book Review,Female Main Character,Fiction,Mystery,The Burglar,Thomas Perry,Thriller. You can follow any responses to this entry through the RSS 2.0. You can leave a response. It is definitely worth a read! Oh, I have this on my TBR too. Have been um-ing and ah-ing about it and waiting for reviews -- and yours is the first one I've read, so I think you may have convinced me to give it a go! It's scary that this could really happen! I haven't read anything by this author before. He's an interesting author. He really writes a large variety. STRIP is great. My favorite by him that I've read is a book called ISLAND. It is out of print, so you may have to dig at your local used bookstore! Her character was truly the highlight of the book! Share book reviews and ratings with Ethan, and even join a book club on Goodreads. A couple years ago, I decided that I would read one book each week. As a way to keep track of this goal, I created this blog. Each week I post book reviews and even giveaway copies of books that I've really enjoyed.